This is the season when ants to begin invading your Massachusetts, Connecticut, and Rhode Island homes once again. In springtime, ants seem to come out of nowhere, from every direction, taking over your yard, your walkways and, if they can find a way in, your home. While there is no way we can get rid of all the ants in nature, nor would we want to, there are ways to deter them from coming in close to our homes, and ways to keep them out if they do come in close. Pavement ants - These are tiny ants (only around 1/8 of an inch in length) that make their nests inside pavement. They dwell in sidewalks, under concrete slabs, and similar areas, but they sometimes get into homes through basement walls and other areas. Pharaoh ants - These are even tinier than pavement ants, measuring in at around 1/16 of an inch. They are often found in hospitals, restaurants, apartment buildings, etc. They have been known to transmit illnesses such as Staphylococcus and Pseudomonas, in hospital settings. Odorous house ants - Measuring at around 1/10 of an inch, these ants produce a distinct odor when crushed. Some describe the scent as the smell of rotten coconuts. These ants are likely to take up residence inside buildings if they can find a way inside. Carpenter ants - These large ants (around 5/8 of an inch in length) do not build or fix anything. They dig tunnels and galleries inside wood. If they can establish themselves inside the wood of a home, they can do severe damage over time. If you want to keep ants out of your home in the spring and summer, it is important to do some things in the fall season to seal up your home and make it less attractive to ants. Eliminate food sources around your yard. Refrain from leaving pet food outside. Remove bird feeders, or place them well away from your home. Clean up garden areas as well as fallen fruit around trees. And make sure food is cleaned up after barbecues and picnics. The fewer food sources you have in your yard, the fewer pests will hang around on your property. Eliminate smells of food in your yard. Ants are not picky. If you have open trash, ants will be attracted. Make sure all of your garbage is stored in tightly-sealed garbage cans. If lids are loose, try fastening them with a bungee cord. And wash out garbage cans if bags break and garbage is spilled inside. Seal up holes in your home. Carefully inspect your foundation and walls and fill in any gaps, cracks, or holes you find. Pay close attention to areas where items enter through your walls--items such as wires, pipes, air conditioning units etc. Be sure to check up high as well. Ants have no problem scaling walls. Using a caulking gun to seal holes works well. Repair any water-damaged areas on the outside of your home. Wet wood is much easier for rodents and other pests to chew their way through, which will let all sorts of pests in, including ants. Remove water sources outside your home. Remove items that collect water. Fix leaky spigots and hoses. And fix areas that tend to hold standing water. The less water you have around your home, the less likely pests will be to hang around your home. Remove food sources from inside your home. Keeping your home free of crumbs and spills will give ants less of a reason to want to hang around. One thing you can do that will not only keep ants from invading your home but also keep a myriad of other household pests away, is to partner with a professional pest control company. 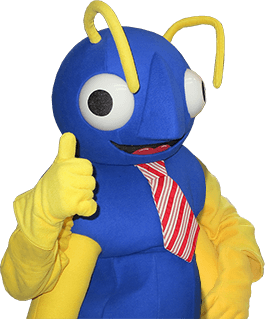 Big Blue Bug Solutions has been in business for over 80 years, helping folks overcome pest issues. To learn more about our year-round pest control options, call us today. Being pest free is the way to be. Let Big Blue Bug Solutions help.